The White House went on lockdown Friday after a vehicle struck a security barrier near the iconic building, the Secret Service said. The female driver of the white Chevrolet van with Tennessee plates was immediately apprehended around 3:30 p.m. at 17th St. NW and E St. NW, the agency reported on its Twitter feed. Law enforcement officials told NBC News that the woman had mental problems and was known to the Secret Service because she's been around the White House before. "No law enforcement personnel were injured during the incident," the Secret Service said. And no shots were fired, they said. A later statement from the Secret Service did not identify the woman, but it said she was 35 years old from La Vergne, Tennessee. 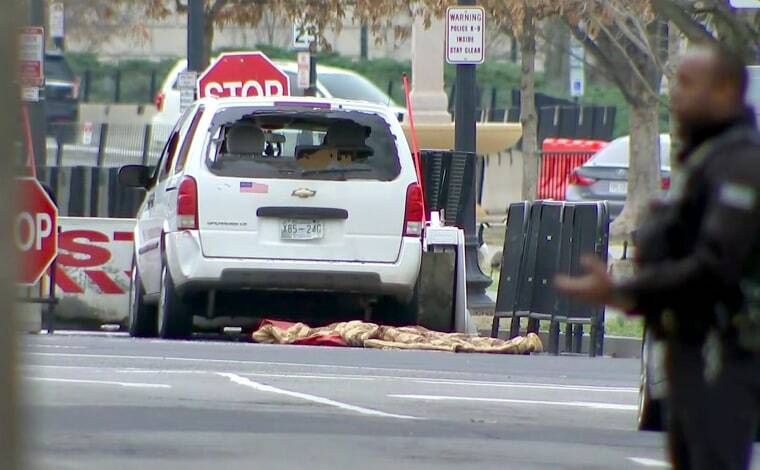 The agency said that she drove into the security barrier outside the White House intentionally, but the van never breached the perimeter. Police said they saw a gun in the woman’s hands which was pointed in the opposite direction of officers during the incident, and she allegedly refused to drop the gun and had it taken from her, according to police documents. The woman allegedly said she had a "BB gun" because if "James Burris" was president officers would shoot her to protect him, according to the documents. She was charged with carrying a pistol without a license, possession of an unregistered firearm or destructive device, assault on a police officer, destroying government property and other charges, according to the police documents. President Donald Trump was hosting Australian Prime Minister Malcolm Turnbull at the time but neither was ever in any danger. Pete Williams and Monica Alba contributed.